In his speech on Tuesday, Xi called Taiwanese independence a “dead end” and warned that, in 2019, China would no longer accept the status quo. “We make no promise to abandon the use of force, and retain the option of taking all necessary measures,” he warned. Tsai, speaking on Wednesday, responded by lamenting that China has consistently rejected the democratic values that, according to her, define the national identity of Taiwan and condemned China for spending much of 2018 attempting to bribe Taiwan’s allies away from recognizing the nation’s sovereignty. Tsai called on China to “face the reality of the existence of the Republic of China (Taiwan), and not deny the democratic system that the people of Taiwan have established together.” She insisted that Taiwan “absolutely will not accept ‘one country, two systems,'” the policy in place for Hong Kong, which nominally allows Hong Kong to remain democratic but technically deprives it of sovereignty. Xi’s regime has increasingly crippled Hong Kong’s ability to govern itself under “one country, two systems” by banning political candidates anathema to the Communist Party’s interest from running for office. “Pressuring international corporations to change their designation for Taiwan won’t bring about a spiritual union, nor will buying off Taiwan’s diplomatic allies or circling Taiwan with military aircraft and naval vessels,” Tsai concluded. The latter remark referred to China’s policy of using “sharp power,” or economic intimidation, to force international corporations to accept its worldview. Throughout 2018, companies such as Ikea, American Airlines, and Marriott faced the brunt of “sharp power,” forced to choose between identifying Taiwan as a country in their legal papers, websites, and drop-down menus or losing access to the massive Chinese market. Three major airlines in the United States ultimately changed their fight booking options to stop identifying Taiwan as a country even as the U.S. government dismissed China’s bullying as “nonsense” and urged them not to do so. Marriott, in one notable instance, fired a social media manager for “liking” a Twitter post by a group called “Friends of Tibet,” which opposes communism. 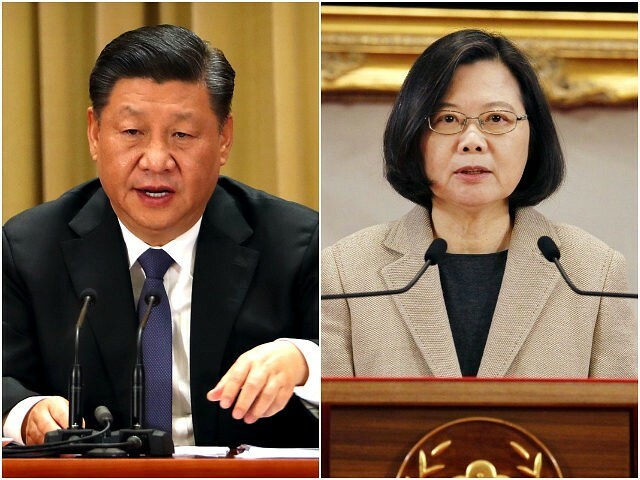 Tsai’s speech on Wednesday followed new year’s remarks from Xi Jinping warning that 2019 would be the last year China would tolerate Taiwan’s existence. He added that Chinese officials “make no promise to abandon the use of force” to end Taiwan’s independence. Asked about the aggressive remarks on Wednesday, Chinese Foreign Ministry spokesman Lu Kang claimed to reporters that Xi was not speaking for China, but for the world. “We make no promise to renounce the use of force. This does not target compatriots in Taiwan, but the interference of external forces and the very small number of ‘Taiwan independence’ separatists and their activities,” he added, likely alluding to the United States as an “external force” against Beijing’s interests on the matter. The threat of use of force is not new for Xi’s regime. In October, Chinese Defense Minister Wei Fenghe said during remarks to the press that “if someone tries to separate out Taiwan, China’s military will take the necessary actions at any cost.” Two months later, the People’s Liberation Army (PLA) reportedly deployed a significantly larger fleet of naval vessels to the Taiwan Strait, presumably to surround Taiwan’s military and intimidate U.S. ships in the area. The Chinese Foreign Ministry argued this was necessary because a U.S. Navy ship had traveled through the sovereign Vietnamese waters in the South China Sea, which China has illegally claimed for itself.